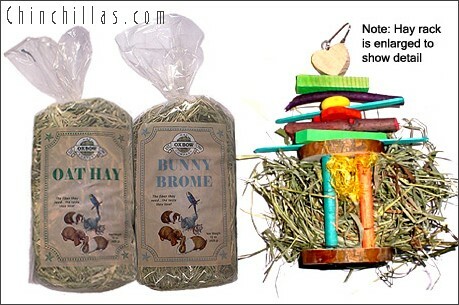 This auction is for a variety pack of Premium Quality Oxbow hays and a Hanging Hay Rack. This toy is great for the chinchilla whose two favorite past times are eating and playing. Four dowel rods fixed between to bark covered wafers provide a great way to get hay up off the floor so that it stays clean.